(NOTE: As truly frightening disaster scenarios approach, we present this as part of a series on how to manage emotions - yours and clients'. For reference see our recent posts Here at our blog's home page. LF: “Chaos isn't a pit. Chaos is a ladder." The problem is that when the chaos arrives, most investors are neither emotionally nor financially prepared to capitalize on it. 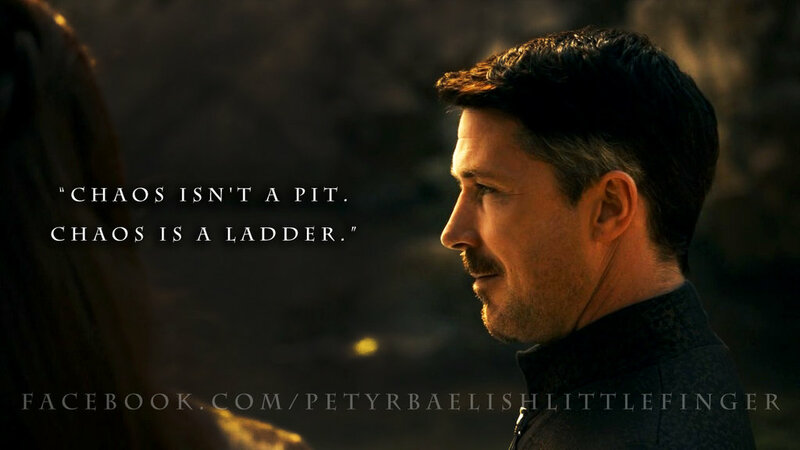 Littlefinger not only anticipated the chaos, he planned for it. Investors should do the same. Every investor should have a Crisis Plan. You will notice that no one ever said, “Make a plan when there is blood in the streets.” That is because when emotions run high, the brain's limbic system (i.e., emotional center) does THIS to the prefrontal cortex. In order to secure our brain's control center we must have a "pre-made" crisis plan in place – one with contingencies. I say contingencies for this reason: One of the worst things that can happen is for “disaster” to strike, to execute a planned response… and then have it not work. (The Maginot Line comes to mind). Whatever your prepared response is, build in continuing responses. Deploy cash. Rebalance. Identify the oversold sectors. Your plan will provide a sense of safety. It will keep your head calm when those around you are losing theirs. Most people only recognize the investing opportunities in hindsight. It doesn’t have to be that way. What To Do: Develop a Crisis Plan for your clients. I do not mean come up with a loose set of actions you agree to take based on a conversation. I mean develop an actual document printed on paper and kept in a folder you can hand to a client. It is an exercise you and your client can do in a matter of minutes. Because the concept of a “crisis plan” or an “emergency kit” is well-understood by clients, you can introduce it quite plainly. Okay, maybe you don’t say chaos is a ladder. But you can. If you want. MarketPsych Insights has templates and outlines for the essential ingredients in for effective Crisis Plans available to service subscribers. Whether you avail yourself of them or not, we urge you to put something in place.